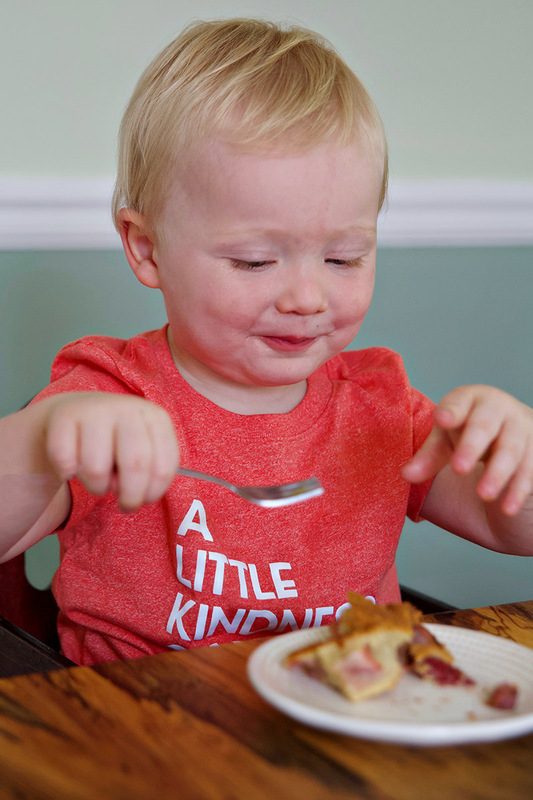 One of my greatest joys in motherhood is participating in my son’s relationship with food. He loves to eat, and eats with a gusto that occasionally makes me envious. I wish I still had the ability to feel that sort of raw enthusiasm for pancakes! 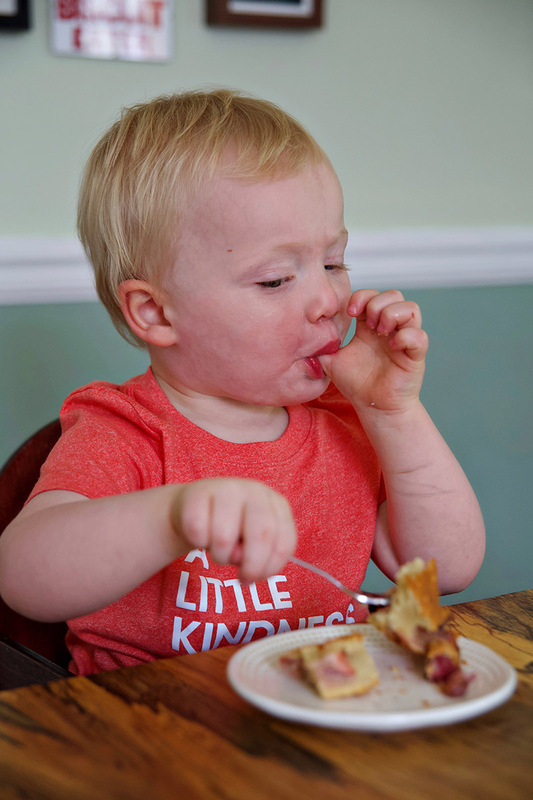 As both a recipe developer and a preschool teacher I have a lot of opinions on kids eating, and I have to say that we have worked hard to encourage Everett to be a good eater. Yada yada yada boundaries and consistency and regular introduction of foods, etc. You know? You know. Sharing my favorite foods with Everett is a joy that shifts and evolves as he ages through each season. His gusto for beets last winter was matched by his unbridled love of lentils this winter. I can’t wait to take him strawberry picking for the first time, to watch him eat his first hot donut from Brit’s, to teach him all the ways that we can make magic in the kitchen together. I very much look forward to the day when he makes me dinner for the first time, though of course as recompense for what we’re currently experiencing I will lay on the floor and yell “NINNER PLEASE” repeatedly until he is done. One of my big rules surrounding my toddler and food is the avoidance of sugar near bedtime. This is, of course, strictly selfish as I am trying to close the door on parenting at no later than 7.30pm each night. Sugar anytime after 5 complicates my plan and I’m just not in the business of making things harder on myself (if I know how to avoid it). Because I’m not a totally mean mom I am a big supporter of breakfast or lunch time dessert, and find brunch to be the ideal time to offer my kid a dose of something wonderful (and crazy making). Everett devoured this strawberry cake with enthusiasm, smiling and laughing and occasionally shouting STRAWBERRY CAKE while he licked his fingers. It made me smile too. 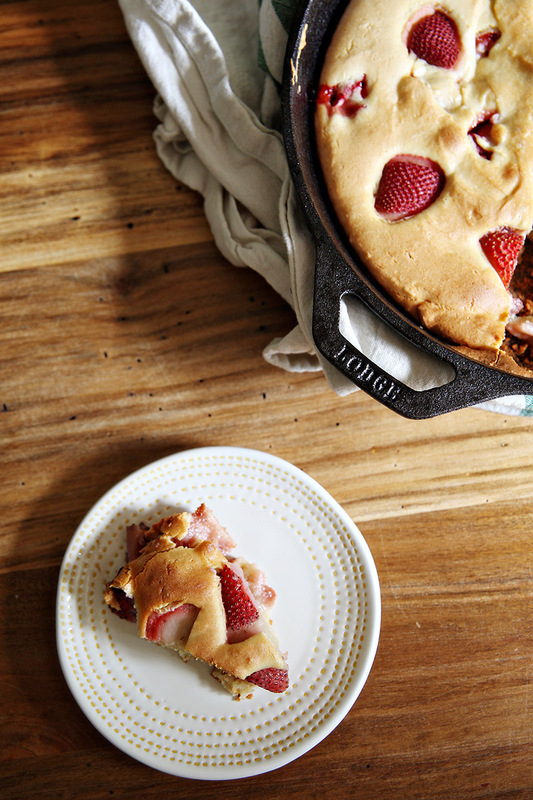 Crisp in all the places it touched the skillet, sweet because of the berries and just the right mount of spongey. This cake was lovely, the perfect treat for a spring brunch. 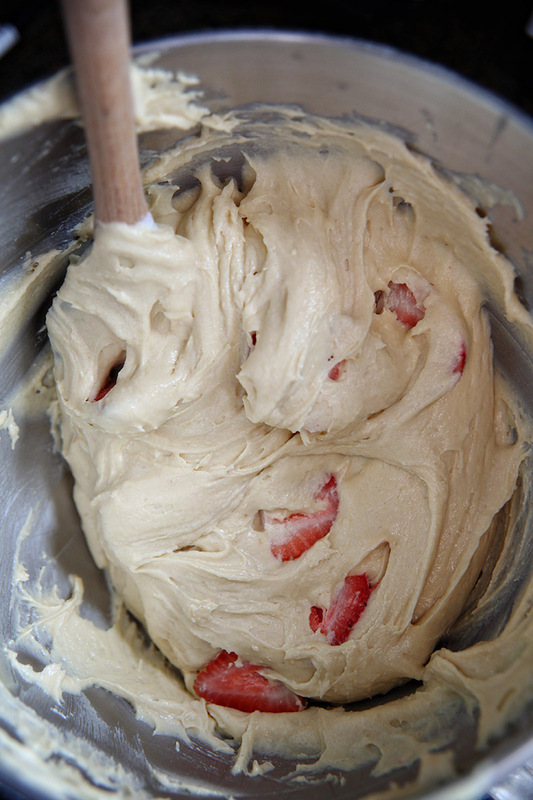 Cream butter and sugar with a mixer. Add in eggs, one at a time, and vanilla. 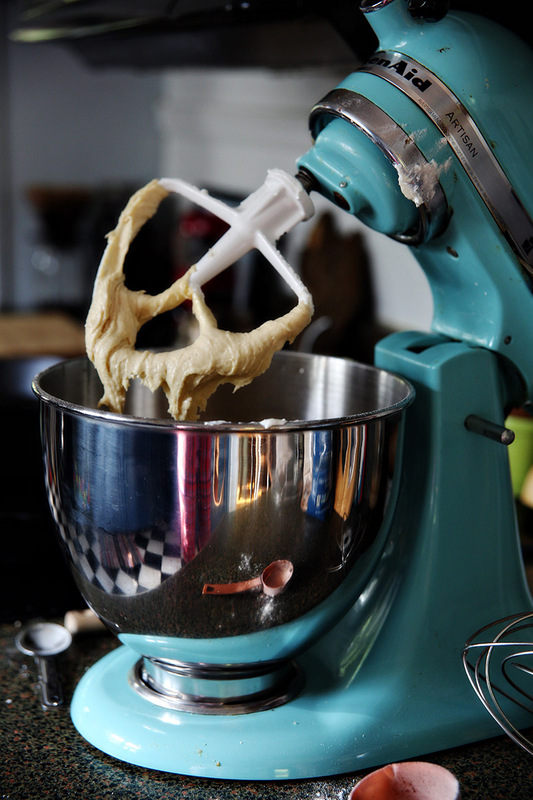 In a separate bowl, combine flour, baking soda, baking powder, and salt. Add the dry mixture to the butter 1/3 at a time, alternating with yogurt. Mix well as you combine ingredients. 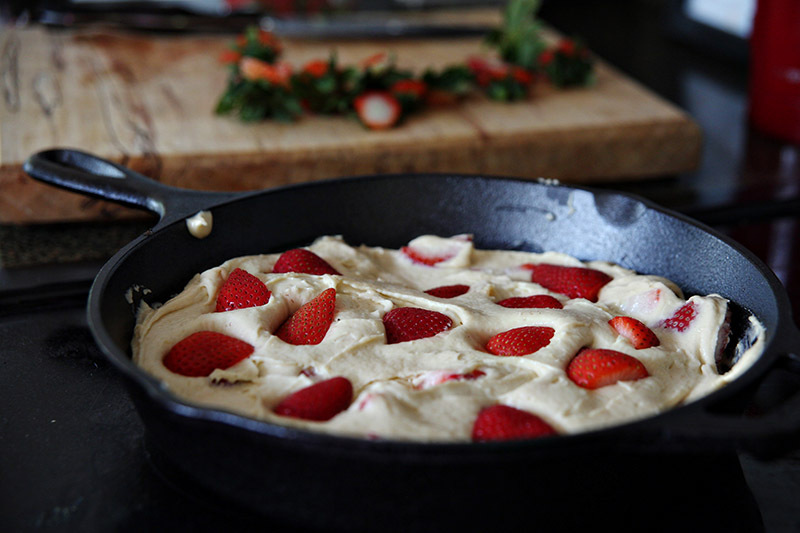 Add strawberries and fold in by hand. 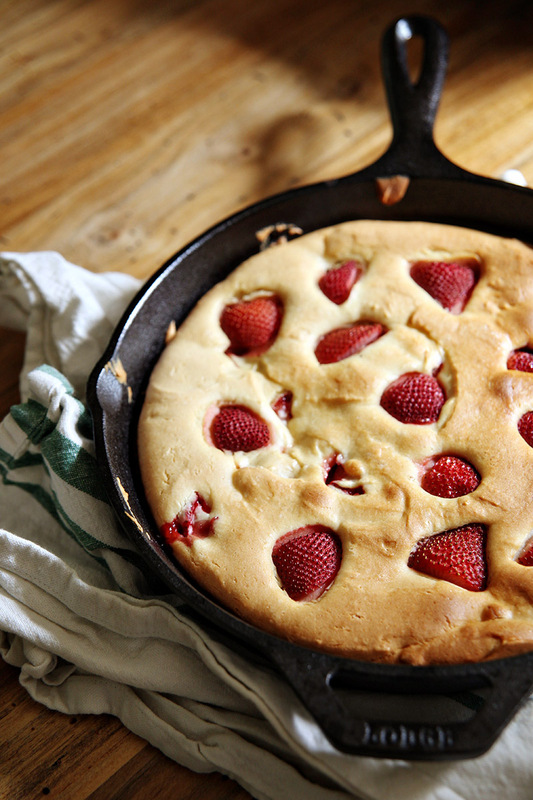 Grease a 10″ skillet and gently transfer the batter to the skillet. Bake for 35-40 minutes or until cooked through and browned. Using a measure for measure flour (we used King Arthur brand), substitute flour for gluten free flour. Increase the amount of yogurt to 1 cup. Ever since we broke ground on our first backyard garden in Baltimore I have wanted to plant asparagus. Asparagus, tender and crisp and one of the the first fleeting signs of spring, takes a prohibitively long time to cultivate as an apartment dweller. Over the years we’ve had gardens in front yards, back yards, pots, and on kitchen counters. We’ve grown herbs and vegetables and even tried our hand at small orchards in pots (all with varying degrees of success), but I’ve always yearned for a kitchen garden that I could make my own, that I could invest time and energy in over the course of years. Thankfully I have that opportunity now, in a yard that I can finally call my own. I have big plans for the garden at our new house, but haven’t yet broken ground. But my dreams! They’re big! I’m thinking of building the beds in the front yard, since that gets the best consistent light. I want tomatoes, so many tomatoes, and peppers, garlic, and kale, and (of course) asparagus. I want a garden we can rotate throughout the seasons, something that can provide food for our table and a little peace for my mind. Tonight’s dinner was borne of my spring fantasies. Spring has finally, gleefully sprung here in Wilmington. That azaleas have painted the town shades of pink, the dogwoods are in full bloom, and everything is coated in a thin layer of yellow pollen. 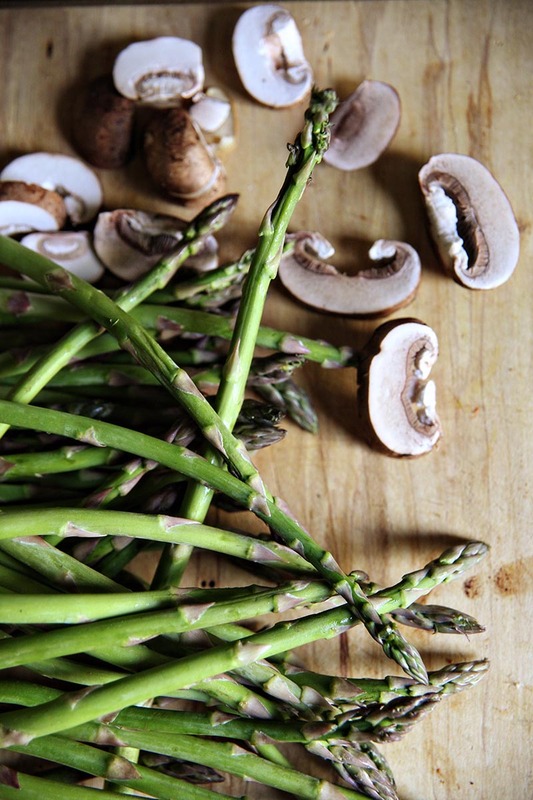 The local farmer’s market opened this past weekend and with it came the first crops of berries and asparagus. 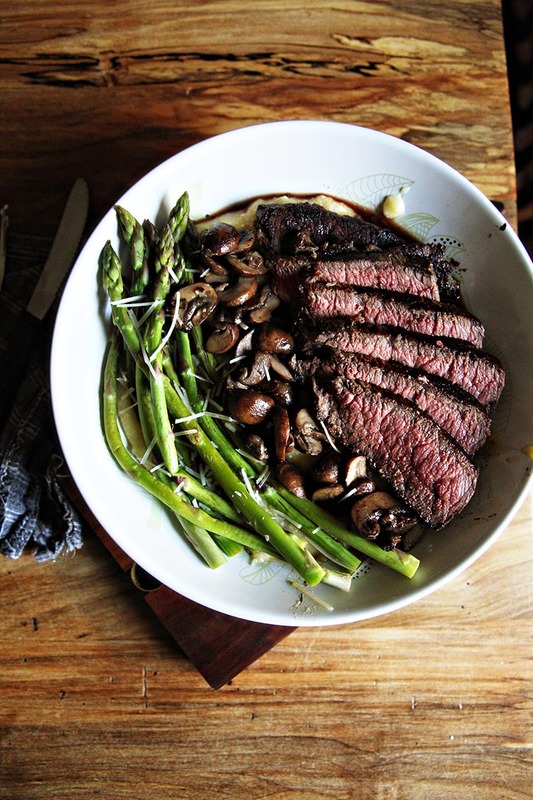 The berries were gone the instant Everett got his hands on them but the asparagus made it’s way into dinner, lightly steamed with lemon and served over parmesan grits with buttery mushrooms and steak charred in a hot skillet. Begin by making your grits. Combine grits, water, salt, and butter in a pot. Bring to a boil, stir well, and reduce heat to a simmer. Cook, covered, stirring occasionally, until the grits are thick. Stir in parmesan and the juice from 1 lemon. 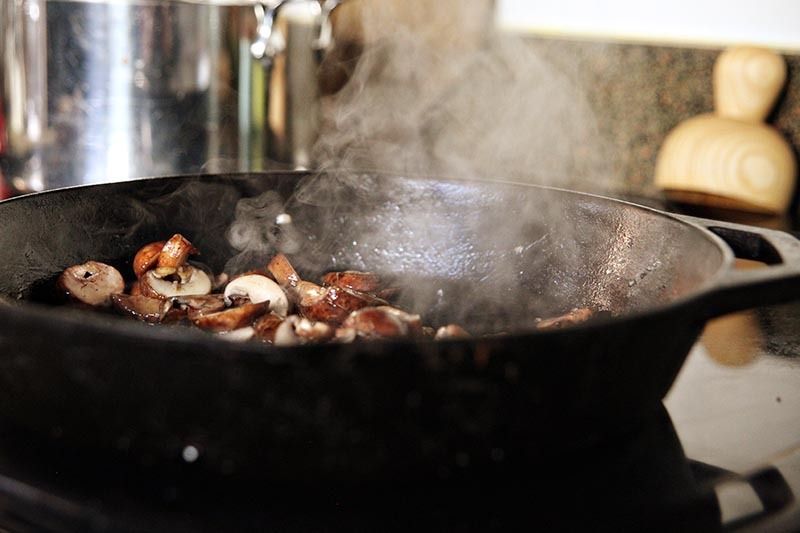 Clean and slice mushrooms and toss them in a pan with 1 tbsp butter. Cook over medium heat, stirring occasionally, for 5-7 minutes. Set aside. Keep the skillet hot and add another tbsp of butter. 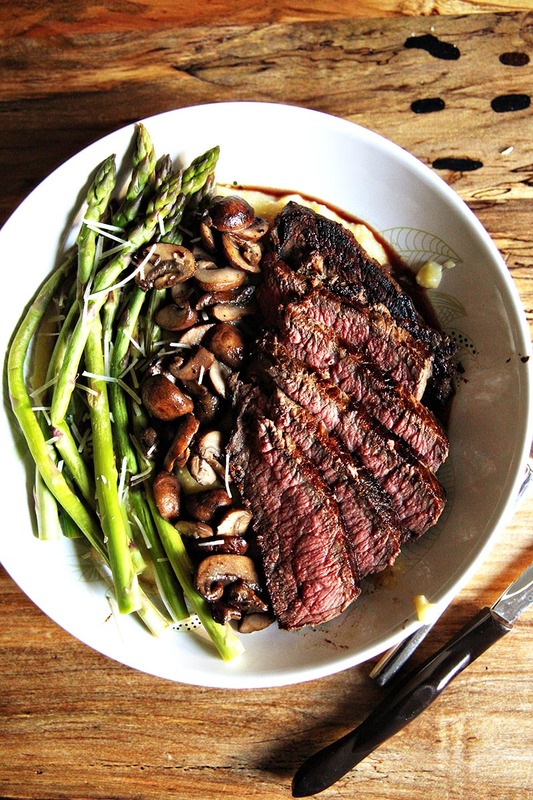 Place the steak in the hot skillet and top with a bit of sea salt. Cook 5 minutes on each side and then allow to rest for 5 minutes. 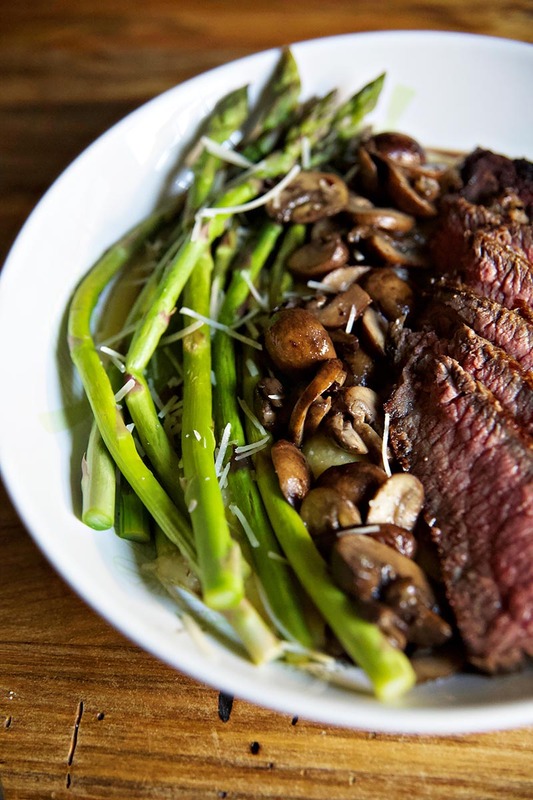 While the steak is resting, trim the asparagus and place in a stainless steel pan with 1/2 cup water and the juice of 1 lemon, over medium heat. 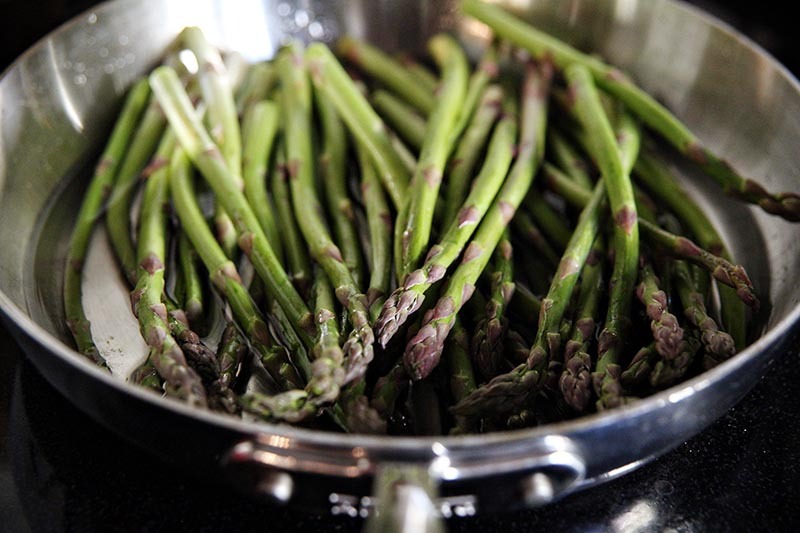 Simmer for 3-4 minutes, until the asparagus is bright green and tender. 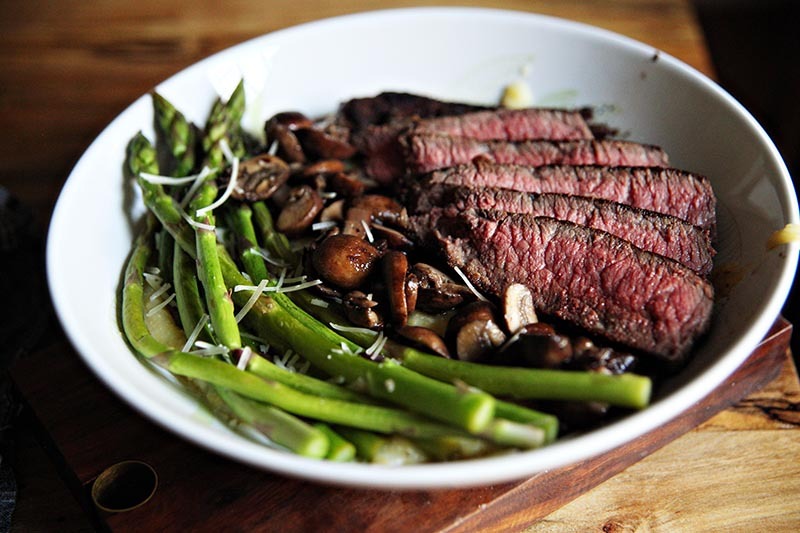 Serve the grits piled high with sliced steak, mushrooms, and asparagus. Top with a squeeze of lemon juice and a sprinkle of parmesan. In preparation for today’s St. Paddy’s Day festivities I’ve been in the kitchen this afternoon roasting some cabbage. 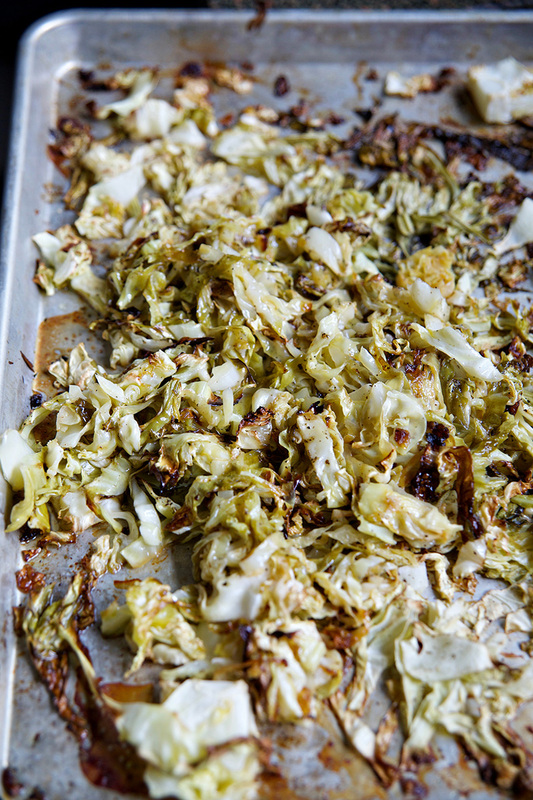 Roasted cabbage is one of my favorite winter time vegetables- it’s easy to come by all winter long, it pairs well with a wide variety of protein, and it offers a combination of flavor, crunch, and nutrition that I’m desperate for during the long winter months. This winter I’ve been trying to be more thoughtful in my weekday meal prep. I realized that I was not eating lunch/scrounging for lunch/going out for lunch way more often than I was being thoughtful about what I was eating. So for the past few months I’ve been sticking to a strict ritual of food prep on Sunday afternoon so that I have lunches parceled out for the whole week before I even have to drag myself out of bed Monday morning. 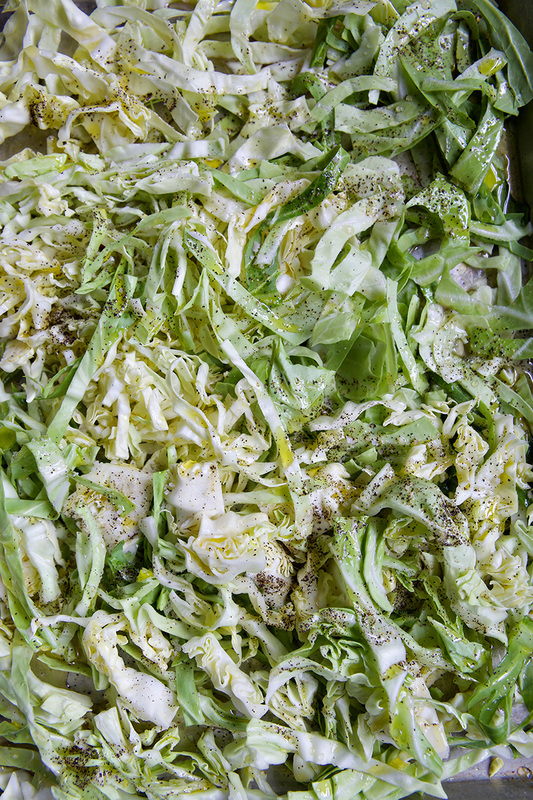 I like my roasted cabbage prepared pretty simply with olive oil, apple cider vinegar, salt, and pepper. 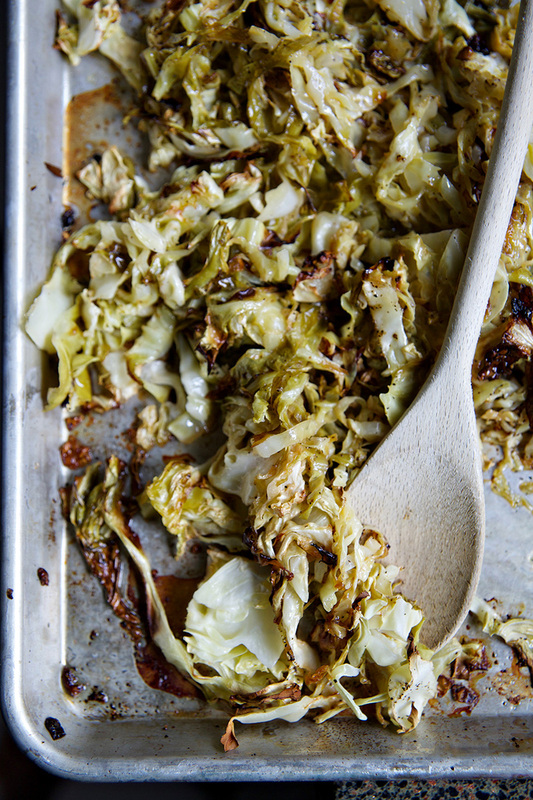 There’s a fine line between perfectly roasted and burnt (I live on that line), and the if you hit it just right the cabbage is sweet and crunchy with just a tang of vinegar. It’s a treat, whether or not it’s St. Patrick’s Day. 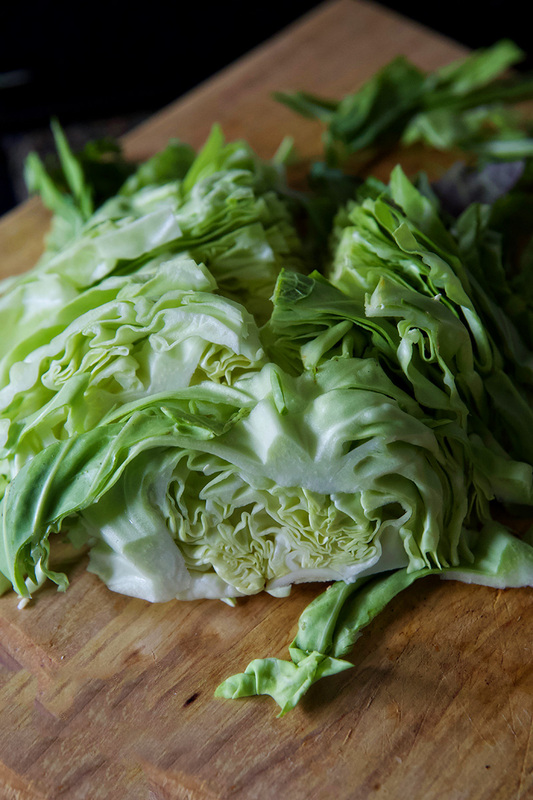 Halve and slice your cabbage into thin (1/4″) strips. 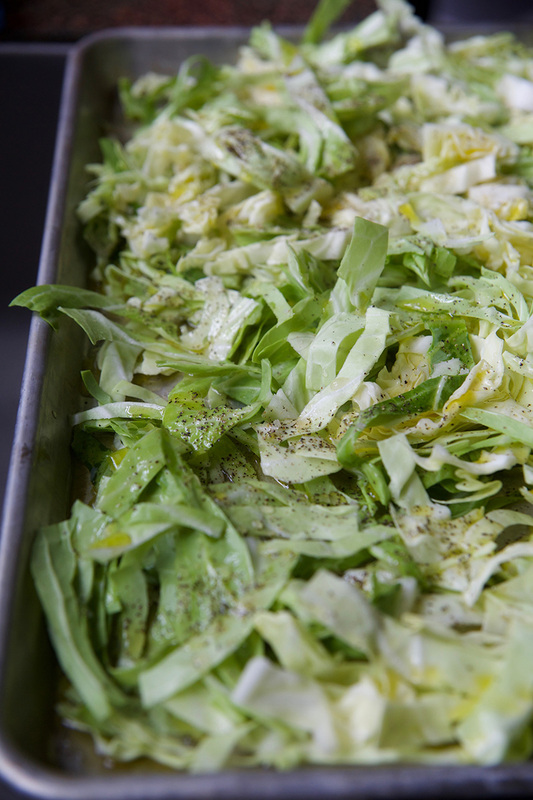 Heat oven to 375F and spread cabbage out on a large baking sheet. Drizzle with olive oil and vinegar and sprinkle with salt & pepper. Roast for 20-25 minutes, until browned.